Before we start the Carnival please send your thoughts and prayers to all our blogging friends and their families who were in the path of Hurricane Ike, several of whom are listed here. We hope you and your loved ones are safe. Hair, more hair, less hair, polished domes, hats and headgear; what an edition this was! Everyone outdid themselves posting some of the most glorious crowns I've had the pleasure to view. The sublime to the ridiculous; they're all here to Smile For The Camera. So, open the cover and browse the 5th Edition of Smile For The Camera's album of Crowning Glory. Enjoy! Janice the author of Attala County Memories posts a lovely photograph of her parents holding her as a baby in James and Eileen Netherland Branch Celebrate 63 Years Together. Love that baby's headcover. Janice can now be read at the magnoliamenories blog at the ClarionLedger.com. Brenda K. Wolfram Moore presents Remembering Nona, by posting a photograph of her sister 'hamming' it up for the camera with her Rita Hayworth Hair, posted at Remembering Nona. I think I'd rather have Rita Hayworth Hair than Betty Davis Eyes. Tina Sansone presents Michael with his Hats & Crazy Hair posted at Gtownma's Genealogy. Tina's son Michael displays the stages of "what's on my head," the evolution of a three year old to a proud graduate. Linda Robbins author of the HollingsworthRobbinsFamilyTree displays a photograph of very long, red Crowning Glory hair blowing in the wind in 5th Edition Smile For The Camera - A Carnival Of Images. A great photograph Linda, and we all know what you're talking about! Maneesh lives in Bangalore and writes at AdmirableIndia.com. He tells us that India is a great country, a traveler's paradise, and proves it by posting some beautiful photographs of Crowning Glory in Lalbagh Botanical Garden, Bangalore: Part 1: Ancient Watch Tower and Organic Cultivation. The author of The Research Journal, Melody Lassalle, has some real desperados hanging out in her family tree and it shows in their head gear. Mosey on over to Get a Load of The Guys in the Hats for a "Crowning Glory" family photo. Bob Franks the author of Itawamba History Review tempts fate by exposing Miss Daisy Riley with her hair down. Bob, I suggest you sleep with one eye open because I'll bet Miss Daisy has her eyes on you. P. S. I'm sure we'd all enjoy reading those clever clues she left to expose her age. Jessica Oswalt discusses Such Lovely Hairstyles, But Who Are They? posted at Jessica's Genejournal. Nine lovely little girls with many different crowning glories and a mystery as to who they are. Can you help? Oh Sasha! The moment I received your submission I knew what was coming, from your very descriptive title - Letting His Freak Flag Fly. So, I'll steal none of Sasha Mitchell's thunder and direct you to her post at Memory Lane. Julie Cahill Tarr wasn't looking for a Smile post when this photograph caught her attention. One look and you'll know this glamour shot would never be satisfied to remain in a stack of old photographs. So Julie shares her find with the world at GenBlog - 5th Edition Smile For The Camera - A Carnival Of Images posted at GenBlog. Sue Edminster's photograph of, It's a bowler.... no, it's a derby....., posted at Echo Hill Ancestors Weblog leads to a wonderful history lesson for those of us who don't know the difference. Great job, Sue! Terry Thornton puzzles us with A Bogo Helmet: The 55th COG and the 5th I Smile for the Camera posted at Hill Country of Monroe County, Mississippi. French or Spanish? Historical or Theatrical? Let me weigh in on the controversy. I believe this is a battle helmet worn by either French or Spanish pygmies who were lacking in military prowess (note the numerous dents in the helmet) and as such are now extinct. You decide. Carol's photograph, Smile For The Camera - Crowning Glory, is one of the most quietly elegant studio portraits I've seen. She asks, "That’s some fancy hat Myra is wearing, isn’t it?" It is, and the fact it was taken in Missouri warms the footnoteMaven's Missouri heart. iPentimento is where Carol hangs her fancy hat. Diary From England's author Naomi Stevens shows us her Great-Grandparents - The Epitome Of Style & Elegance. Take a look at this 100 year old tin type and see if you don't think Naomi's Grandfather looks a lot like Kevin Bacon. I do! Lorine McGinnis Schulze, the consummate photograph collector, shares a family photo of four very talented young women and their beautiful "Crowning Glories" at Olive Tree Genealogy. Hats to die for! Brett Payne, author of the fantastic Photo-Sleuth blog, treats us to The Fauntleroy Suit - An Example From London In The Early 1900s. The things the Victorians did to their children in the name of fashion. So much Crowning, so much Glory. Pam Taylor has a very unique and interesting photograph displayed at Smile for the camera- Crowning Glory on her Taylorstales-Genealogy blog. This looks like a wedding photograph with the bride wearing the wedding ring on her right hand. I'll bet there's someone out there who can give Pam an expert opinion as to the occasion for the photograph. I love Sheri Fenley and her sense of humor; and this submission to Smile is so, well, Sheri. Please visit the Monsignor's chapeau or the "Saint of the Week" hat in Crowning Glory posted at The Educated Genealogist. If this doesn't make you Smile, nothing will. Lori Thornton introduces us to Great Great Grandma Nancy posted at Smoky Mountain Family Historian. While the centerpiece of this photograph is the great hat she's wearing, why is it that Great Great Grandma Nancy is drawing our attention to her neck? Could it be her jewelry? 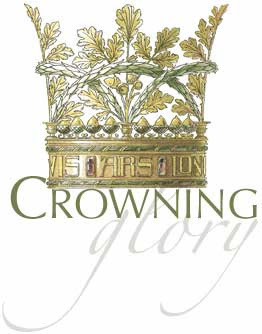 Janet Iles writes about Crowning Glory - Two young women with flowery hats posted at Janet the researcher. An orphan photograph in the sense that Janet doesn't believe those pictured are members of her family, but they are identified. Two lovely young women whose hats might present a problem in the wind. Lidian, of the incomparable The Virtual Dime Museum, delights us with a "Crowning Glory" in The Bearded Chromotype. We wonder if the Reverend was subjected to a bird nesting problem should he stand still too long. Miriam Robbins Midkiff introduces us to Trijntje Gerrits (DOLSTRA) VALK (1826 - 1912) posted at AnceStories: The Stories of My Ancestors. Miriam tells us, "This article features a photograph (and biography) of my 3rd-great-grandmother, Trijntje Gerrits (DOLSTRA) VALK, wearing a traditional cap from her village of Marrum, Ferwerderadeel, Friesland, the Netherlands. The style of Dutch traditional costumes, including both men's and women's dress, cap, and shoes, varied from village to village. It is the only photograph I have of an ancestor from the Netherlands wearing traditional clothing." Colleen McHugh takes us Stylin'! at Orations of OMcHodoy. "I could have posted pictures forever," Colleen tells us. Those she has posted comprise a stunning collection of hair and hat dos and don'ts. The last photograph is my favorite though. Life At The Home20, authored by Laura Womack, shows us that everything old is new again in her article Crowning Glories circa 1898. She also offers a hairdresser's expertise to explain those poofy buns. Great photos! Msteri, of Heritage Happens (and doesn't it just), pens an Ode to Dagny's Hat. Look out all you genea-poets, Mysteri is a real contender in this category. "The only picture I own of Dagny in a hat - I treasure this and really think that" - you'll have to visit her blog for the rest of the poem and the terrific photograph of Dagny's Hat. Linda Stienstra presents Our Family?s Crowning Glory! posted at From Axer to Ziegler. Hats and Hair! Our family tries! Sometimes we succeed, sometimes we don't. You decide which of us don't. . . . Linda, loved them all! Oh, and love your name, By the way! Amy Coffin presents Hat Dude: Smile for the Camera posted at We Tree. Amy says, "Introducing a gent I call "Hat Dude." He wears quite a crown, but I need more information as to why it is so glorious. Is there an early 20th-century German-fashion expert out there?" Maybe it's hat Dudette, hard to tell. Thomas MacEntee decided to let you all in on his Hair's Tortured Past, in pictures no less, at Destination: Austin Family. Thomas, tortured, past, present, hair - need we say more? This is the Thomas we all know and love. Richard Cheek presents Smile for the Camera: Crowning Glory posted at The Cheek That Doth Not Fade. Richard tells us, "I just couldn't do a single picture with all of these to choose from, but I did save the very best for last." Yes, indeed he did! Ruth Stephens of Bluebonnet Country Genealogy made Her crowning glory? a hats only article. They were all glorious and I couldn't pick a favorite, but I am leaning toward "Three Little Maids Are We." Which photograph would you select? Wendy Littrell author of All My Branches Genealogy, wrote What Were We Thinking? Wendy said, "Here are several photographs (including an embarrassing one of me!) that show off some of my family's crowing glories - from flowery bathing caps to big old bows!" A lovely family album. Nikki-ann, author and photographer of Notes of Life, decided to share a picture of her big brother AJ, Crowning Glory - AJ's Hair!, just don’t tell him. Nikki-ann had also recently done a follow-up Show and Tell post about Alfred's Top Hat and the photograph is just too good not to include in this Carnival. Chery Kinnick, Nordic Blue, presents Crowning Glory, or Not. All are Johnsons, tried and true. . . and have a common female Norwegian-American ancestor to thank for their shining glories (domes). We've missed you Chery, so glad you're back blogging. Lisa authors When feathers were in: A tip of the hat to Hungarian dancers posted at 100 Years in America. "For this edition of the carnival I couldn't help but share the traditional hats sported by my great-grandfather's Hungarian dance troupe. It looks like feathers were in. . ." Great photos! The only ones not dancing might be the birds. Donna Pointkouski presents Smile for the Camera: Crowning Glory posted at What's Past is Prologue. Let me just say, "Calling Dr. DNA! Calling Dr. DNA! Emergency! Emergency! Come right away!" Denise Levenick author of the The Family Curator posts Arline and Christian Smile for the Camera uniting generations in a look at hats worn nearly 100 years apart by Arline Allen Kinsel and her grandson Christian. I too think Arline would have loved her spirited grandson, Christian, the fiery-headed Californian who obviously likes hats as much as she did. Janet Hovorka, everyone's favorite Chart Chick, presents the most beautiful Crowning Glory--5th Carnival of Images. Moms know best, except when you're a four year old fashion maven. Some women just have a sense of self from a very early age, and Janet was one of them. Becky Wiseman has some of the most unique photographs I've ever seen and she demonstrates that fact again in The Hover Children :: All Dressed Up posted at kinexxions. Three children, three hats, one fantastic photograph! Miss Jocelyn as "Jo" Cool posted at A Pondering Heart. Miss Jocelyn as we haven't seen her before in her very "Cool" Crowning Glory. Sue Tolbert submitted Crowning Glory -Smiling for the Camera posted at Nana's Diggins. Sue proved to be a winner for her photographer father, Wednesday July 25, 1951, but I'm sure he thought he was a winner with or without the $5.00. Sheri Bush (my BFF) at TwigTalk knows a good photograph when she sees one. In Glorious Hats! - Crowning Glory she introduces us to some orphaned photographs of beautiful women wearing hats. You're right Sheri, they don't deserve to be forgotten. Jasia, Creative Gene, has done it. She has pushed the footnoteMaven to the very brink of "photograph envy" in her post Edwardian Women in White Dresses and Their Crowning Glory. Beautiful women, white dresses, fashionable hats, the Birthday Club has some real competition! Jessica Snyder of AKA Nancy Drew attends her first Smile Carnival with a photo of her grandmother, Lillian Deau Draeger, taken when she was a young woman around 1914. Jessica says, "I love the chapeau – very flapper-ish!" Take a moment to stop by AKA Nancy Drew and welcome Jessica. Life may be challenging Jessica again, she lives and works in Houston, Texas. From a fez, to a gorgeous head of silver hair, to an elegant lady's hat, to the symbol of education, John Newmark has them all in photographs. He posts them in all their glory as we travel the Carnival at Home is Where You Hang Your Hat on his blog TransylvanianDutch. Excellent crowns all! Dru Pair presents Grandma Emma's Family Hat Traditon posted at Find Your Folks. Learn about the hat tradition of her maternal grandmother Emma. A beautiful host of crowning glories and a beautiful explanation written by Dru. Another time and place. How I love Tradition! Elizabeth O'Neal, of Little Bytes of Life posts a Crowning Glory: The Long and the Curled of It; a photograph of the day when a woman's hair truly was her "Crowning Glory." I'll wager she brushed it one hundred strokes every night before she went to bed. Elizabeth has also included a poem she heard as a child and not, she says, because she was horrid. M. Diane Rogers, at CanadaGenealogy, or, 'Jane's Your Aunt,' introduces us to Na's Hat - Smile for the Camera. Whatever happened to women's hats? Something that was a part of our ancestors' everyday life. I don't know, but they've all come to the Carnival. Craig Manson of GeneaBlogie has a photograph that is a Crowning Glory Indeed!. A photograph I covet, because it's the only woman wearing glasses I don't own. Glorious! A beautiful photograph of three little children, Three in Hats; siblings caught in a moment in time. Stephen J. Danko, Steve's Genealogy Blog, always posts the perfect photo with the perfect observations for Smile. What's his secret? 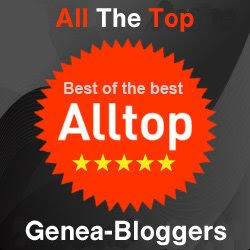 Randy Seaver of Genea-Musings has two posts for Smile. The first is the best head of hair in my photo collection. Ada Woodward is a thirteen year old with beautiful hair. You can tell from the photograph she's very proud of her "crowning glory." His second submission is the the three Seaver boys, love the dos. Flat top, crew cut; you guys are stylin'. And closing the cover on this Smile Album is Burton Holmes And His Pith Helmet. Men in hats, village people, displayed at footnoteMaven. As always, my ancestors and Burton Holmes are here to Smile For The Camera! Thank you to everyone who participated in this fantastic 5th Edition of Smile For The Camera and welcome to all the first-time contributors. (52 participants with 54 truly unique contributions!) It is evident from each and every article that a great deal of time, effort, love and even some fun and good humor went into each photographic contribution. As Randy would say, please take a moment to stop and comment and show your appreciation! As you know, during the Genea-Blogger Games, Smile For The Camera was looking for a guest host for the 10 October Smile. That winner is Becky Wiseman of kinexxions. Becky said, "I'm a big fan of yours and am blown away with how you get so much information from little clues in your photographs and the amount of time you spend researching those photographs." Becky was one of the inspirations for Shades, so I could not be more pleased that she will be the 10 October host for the Smile Carnival. And thank you, Becky, for the kind words. 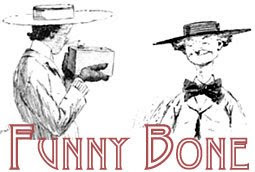 Becky's word prompt for the 6th Edition of Smile For The Camera is Funny Bone. Show us that picture that never fails to bring a smile to your face! An amusing incident, a funny face, an unusual situation. Share! Choose a photograph of an ancestor, relative, yourself, or an orphan photograph that tickles your Funny Bone and bring it to the carnival. Admission is free with every photograph! 1. Send an email to the host, Becky Wiseman. Include the title and permalink URL of the post you are submitting, and the name of your blog. Put 'Smile For The Camera' clearly in the title of your email! This one was a dandy, fM! My hat's off to you ;-) What a tremendous amount of work you put into this edition. And you did it with your usual style and elegance. Here's a round of applause for another great edition of Smile! What a delightful read! Your work is to be commended. From the use of the little flourishes separating the entries to the thumbnail images of the entrants, your work is always a delight and pleasure to read. The layout and design of your blog is always impeccable and the work you do with Smile for the Camera is certainly appreciated. I've had so much fun visiting the entries. fM, you have outdone yourself again! The only thing better than each post is your write-up. You always find a tantalizing turn of phrase to get my mouse clicking over to each site. Thanks for all your work to make the Carnival such a success. Thank you for also including my 2nd Top Hat post... Very much appreciated! SUPER! What an issue -- thanks, Maven, for all the good links. You just set the bar much higher in presenting a carnival/roundup/summary. Many thanks for including my post. This is another great carnival. There are so many great posts here. I'm going to try and get round and visit everyone. Thank you fM for the huge effort you've obviously put into compiling this edition, my first, of the Smile for the Camera Carnival. A huge number of articles to read through and a wonderfully varied collection of images to enjoy. I will certainly be back next month, if I can. Thanks also to the many contributers! I just came across this "Smile for the Camera" in a surf while trying to learn how to do a family tree of my own. Slowly my family is falling into line one by one. In a month my little family has branched to 410 people now and still growing. This sharing of the families in photos and memories is a joy to see and wander through. They all touched my heart and brought my own memories of family to life. It isn't about names and numbers on page it is the people behind those names. Thank you so much for teaching me a bit more.